In a little less than two months, the Zune will celebrate its first birthday. Things seem to be going well for the Zune — Microsoft reached its first sales target, they recently dropped the price of the Zune, and speculation is rampant that the company will expand the lineup of Zune devices in time for the holiday season. Yet with the recent iPod announcements from Apple, and the departure of an important product manager, one can’t help but wonder if the Zune is, well, doomed. Let’s find out by exploring some of the Zune’s strengths and weaknesses. In July, Microsoft announced that it had sold 1.2 million Zunes, eclipsing the goal of 1 million for the company’s fiscal year ending June 30th. That’s not bad for a new device, but it’s nowhere near the sales figures for the iPod. In the same time period (November 2006 to July 2007) Apple sold over 40 million iPods. In fact, in the first eight months after launching the iPod, Apple sold almost 400,000 units. And don’t forget that was back in 2002 when the portable media player market was much smaller. Microsoft seems content with how the Zune is selling thus far, at least publicly. Behind closed doors I’m sure they are less pleased. If Microsoft wants to have any chance of giving Apple a run for its money, they need to have more devices in the hands of more people, simple as that. Since launch, the Zune has had intentionally crippled support for Wi-Fi. Crippled, because only Zune-to-Zune wireless sharing is supported. There has always been speculation that Microsoft would remove the restrictions on the Zune’s Wi-Fi connection, allowing it to connect to the Internet, but that never happened. And then Apple launched the iPod Touch. Instantly, one of the Zune’s key differentiators disappeared. With the iPod Touch, users can surf the web via the included Safari web browser. With wireless networks everywhere, the ability to quickly jump on the web using the portable media player you’re carrying with you anyway is definitely a nice feature to have. Microsoft really needs to address this shortcoming, if not with the existing generation of Zunes, then in future releases. The iPod may have started out as a single device, but today there’s an entire line of iPods. The current generation includes the screenless iPod shuffle, the iPod nano for video, the iPod classic, and the iPod touch. You might also include the iPhone in that list, as it includes the same media capabilities as the iPod touch. By comparison, there is one and only one Zune. It seems pretty certain that Microsoft intends to broaden the Zune lineup this holiday season, but they’ve been pretty tight-lipped with the details. A post at ZuneScene suggests an October 16th release date for new Zunes featuring a new “squircle” button (a square with rounded edges). Expanding the Zune family will definitely help sales. Harvey Chute at Zunerama suggests that there are holes in the iPod lineup that Microsoft could exploit. For instance, the largest capacity iPods have a relatively small, non-widescreen display. Harvey suggests that a high-capacity, widescreen Zune would fill a market void, and I think he’s right. Microsoft would be wise to find more of these niches. One thing the Zune has that the iPod doesn’t is the ability to buy a subscription. Subscriptions are great for people who just want access to music and aren’t concerned with purchasing it. Microsoft calls their subscription offering the “Zune Pass”, and it costs $14.99 USD per month. If you have a Zune Pass, you can download pretty much any song you want from the Zune Marketplace, and you can play it as many times as you like, so long as you maintain the subscription. Microsoft needs to take this to the next level, and they need to educate people. You know the “I’m a Mac, I’m a PC” commercials that Apple does? Perhaps Microsoft should copycat with “I’m a Subscription, I’m a Purchase”. Start highlighting the benefits of subscriptions. If nothing else, the campaign would receive a lot of attention! And if Microsoft really wants to do something bold, why not offer video subscriptions? I’d much rather subscribe to a TV show than have to purchase each episode individually. Convenience is a much bigger selling point for video than it is for music. If Microsoft could figure out how to make video subscriptions really simple, the Zune would have a huge advantage over the competition. Earlier this month, Microsoft dropped the MSRP on the Zune from $249 USD to $199 USD. That compares to $199 USD for the new 8 GB iPod nano, and $249 USD for the new 80 GB iPod classic. With a bigger screen and an integrated FM tuner, the 30 GB Zune at $199 is quite attractive. Microsoft needs to continue to price the Zune (and future Zune editions) aggressively. Even if the Zune beats the iPod on a feature-by-feature basis, the iPod will probably still sell well at a higher price simply because of the brand. I’m not saying make the Zune dirt cheap, but do endeavor to make people think twice before plunking down more money for the iPod. The Zune integrates very nicely with the Xbox 360 console. Simply connect the two, and you can watch or listen to anything stored on the Zune from the Xbox. The Zune will even get charged while it is connected. This too can be improved. Enable streaming to Windows PCs in addition to the Xbox. 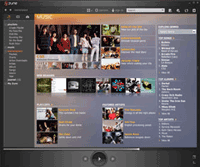 Add Zune functionality to Windows Mobile (say, accessing music using a Zune Pass). Make it easy for the Zune to communicate with Windows Home Server. Add a mobile version of Internet Explorer, open up the wireless connection, and make Silverlight the platform for Zune applications. The point is that Microsoft has lots of products and technologies at their disposal. They need to get better at leveraging them to help strengthen the Zune. No Zune Phone. It might be tempting to make a Zune phone, but I think such a move would spell disaster. First and foremost, the negative publicity Microsoft would experience for “copying” Apple could prove to be too great for the brand to overcome. Secondly, Microsoft also has an excellent phone platform in Windows Mobile – no need to screw up a good thing. Fortunately, it seems as though a Zune phone is out of the picture. No Zune Gaming Device. Microsoft has a strong gaming brand with the Xbox, and if they want to release a portable gaming device, it too should be branded Xbox. One of the reasons the iPod has been so successful is that the brand is synonymous with portable media players. Microsoft needs to try to achieve the same thing with the Zune brand. Adding gaming functionality would only confuse things. More special edition releases, like the Halo 3 edition. Native device support for MPEG-4 and H.264 video, removing the need for transcoding entirely. Automatic downloading of personalized content a la this patent recently unearthed by ZDNet. The Zune definitely has some catching up to do when compared to the latest generation of iPods. That said, there is still hope for the platform. Microsoft needs to build on the strengths of the existing Zune, expand the lineup to include more device types, and leverage some of their other products to help the Zune grow (being careful not to violate any anti-trust laws, of course). Microsoft has definitely got its work cut out. Doesn’t Zune use DRM? You know, the vile creature in the coffin that Amazon nailed down yesterday?